A small Rouge Trader style army. The are some post 92 Landraders and Dreadnoughts used to fill it out but most of the models are pre 1993 miniatures. 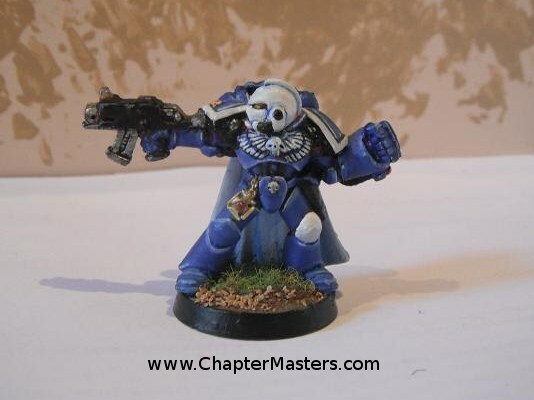 This is the original ultramarine Captain. This model is becoming a little rare but is still easy to pick up on auction sites. There is a noticeable and intentional resemblance to Captain Cato Sicarius. This is a 1989 Space Marine Veteran Captain. 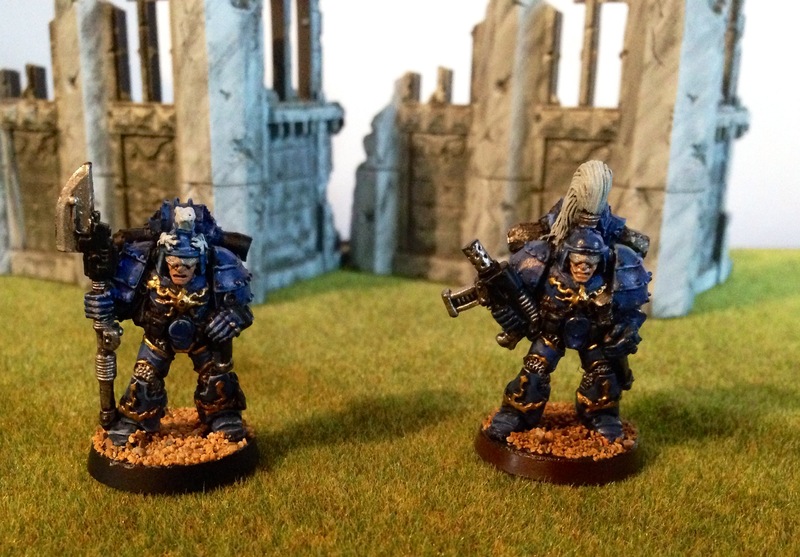 It has been painted as an Ultramarine Captain for use in the 5th Company. This model is was was one of the first Mk7 Power Armour Captains. 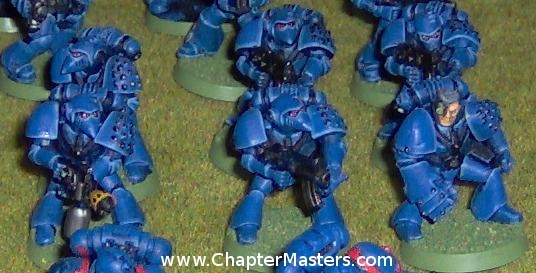 Most of the other captain models produced at the same time were for Blood Angels, Dark Angels or Space Wolves. 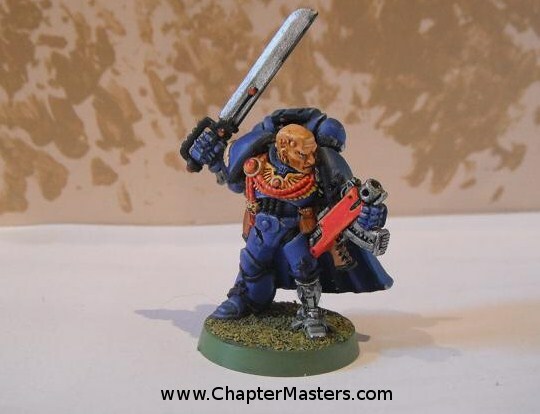 This Captain came with only a bolt pistol and digital weapons so wasn’t very popular choice.A plastic Power Sword has been added to the digital weapon hand to improve the close combat ability of the Captain. 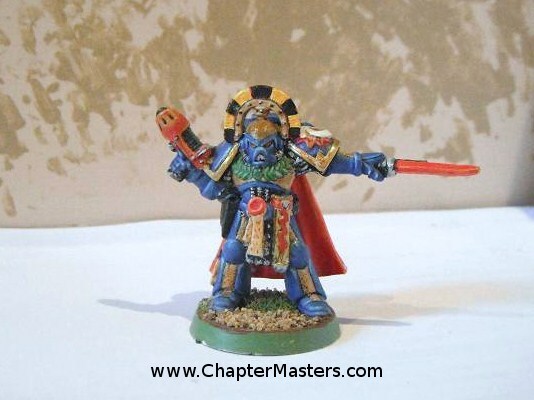 This is a very rare 1992 Limited Edition Games Day Space Marine Captain who I painted as a Ultramarine in 2008. This model is much rarer that the current limited editions models as only a few hundred of these models were ever made. In 1992 games day was a much smaller affair. There were only a few hundred tickets in the UK, it would be a few more years before it was started to be held overseas. The model was featured in the 40k second edition rule book as a Dark Angels Captain. There is also a very similar looking drawing in the 40k 4th edition Space Marine Codex next to the Captain entry on the army list. 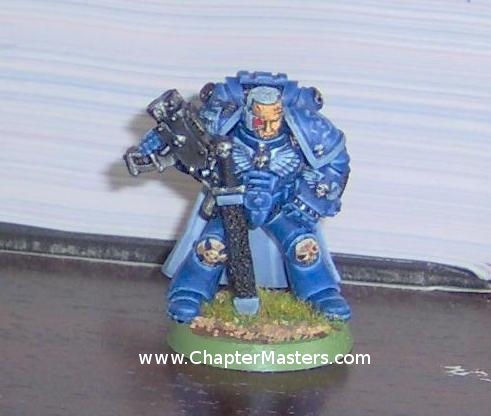 This is a 1989 Space Marine Captain Captain with Terminator honours. 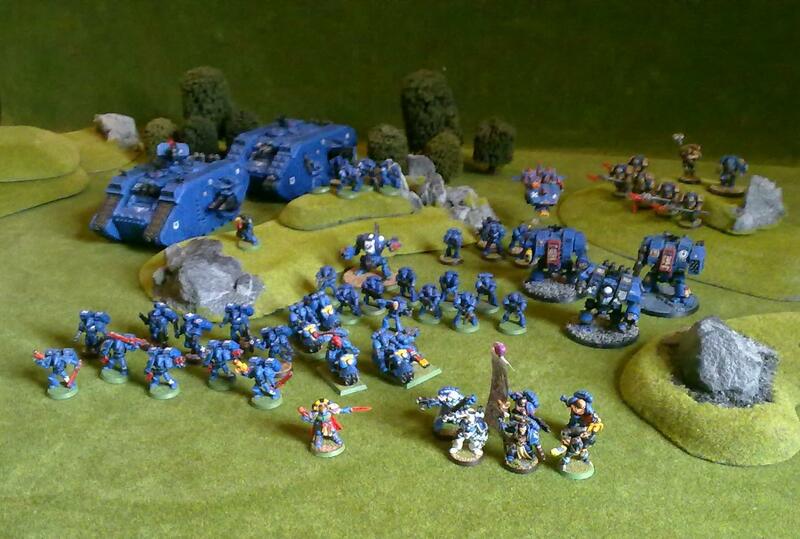 It has been painted as an Ultramarine Captain for use in either the 1st or 10th Company. This model was one of the first Mk7 Power Armour Captains. Most of the other captain models produced at the same time where for Blood Angels, Dark Angels or Space Wolves. This Captain was the only one with a power fist and was therefore a popular choice. 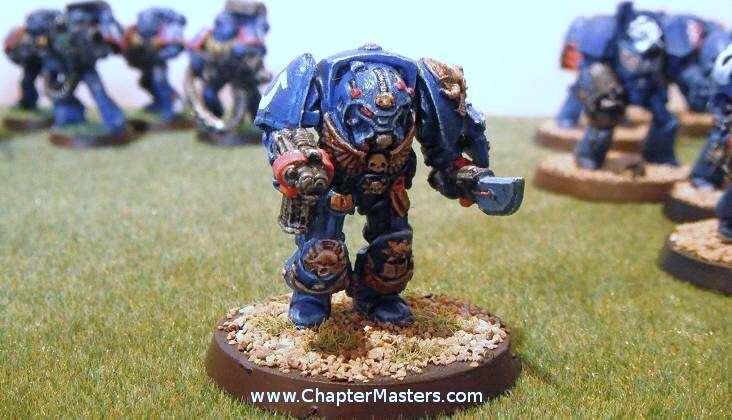 This model was used as an Ultramarine Captain in the second Space Marine codex. Out of Production 1989 Terminator Librarian, Painted Ultramarine. This model was part of the RTB09 Space Marine Terminator box set. 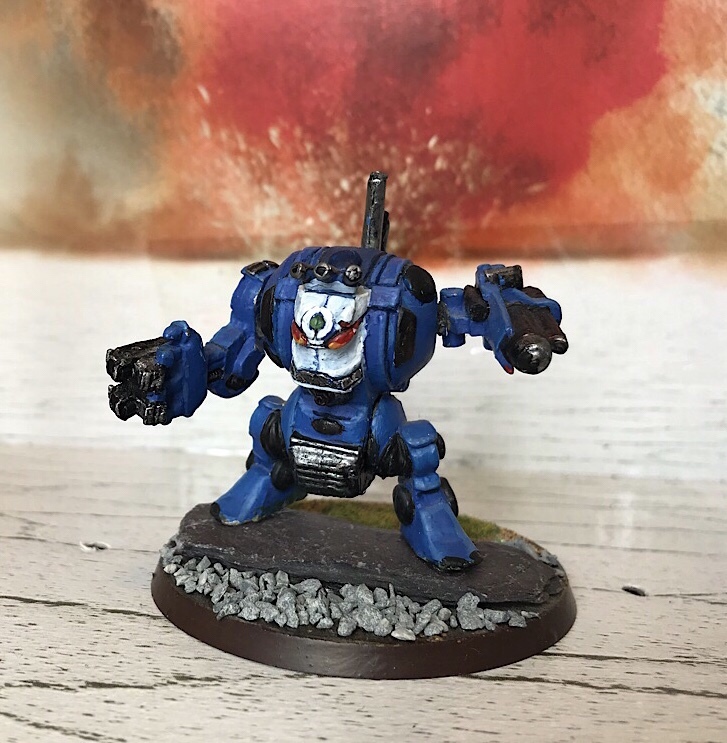 Armed with a force axe and a storm bolter, other than having been mounted on a larger base this model has not been altered from the original design. This Legion of the Damned squad is made up from old Metal Rogue Trader era MK8 space marines and the Limited edition Sargent Centuries from the opening of the 100th Games Workshop. 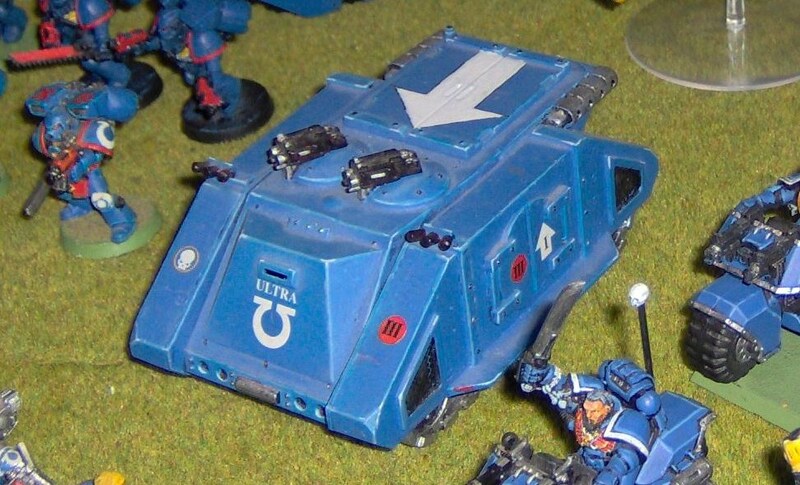 One Marine has been upgraded to carry a Heavy Bolter taken from a Landspeeder. Here he is the original and not the best Dreadnought to come out of GW’s Forge. I have repainted this model more times than I can count. Part of me want to try it again. However I know I’ll never be happy with this lead monstrosity. All that said he does have a charm all of his own. 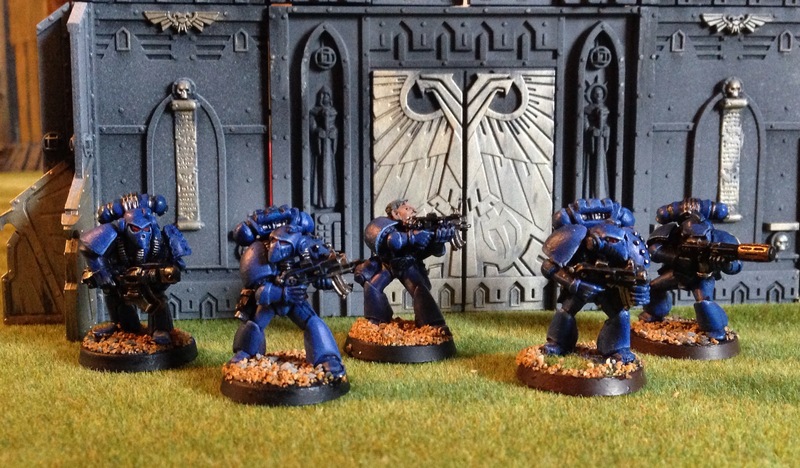 This Terminator Assault squad is armed with four pairs of lightning claws while the Sergeant uses a thunder hammer and storm shield. This combination is great for maximising anti troop capability but still retains one storm shied to give a 3+ invulnerable save against heavy weapons and a thunder hammer to penetrate armoured vehicles. 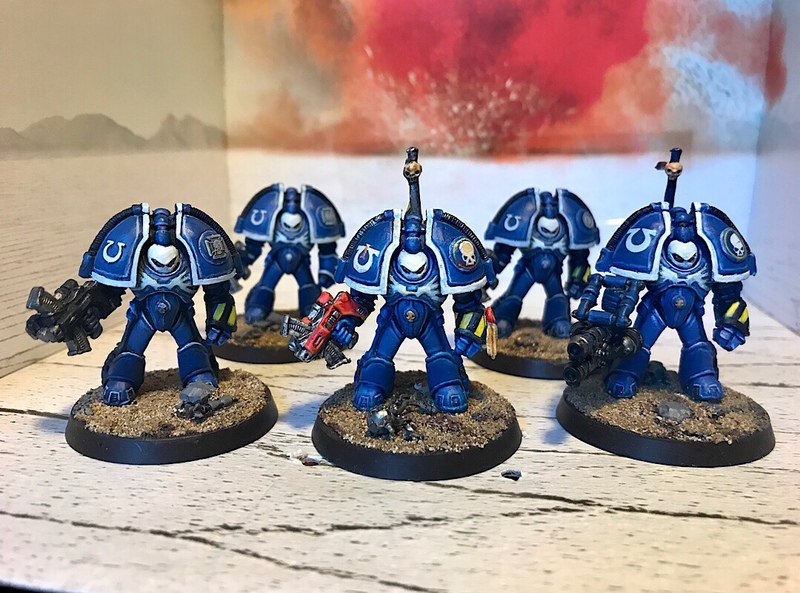 A few different types of terminator model make up this 10 man squad. The Front row is mainly plastic models from the second Space Hulk Box set while the back row is made up of models from the first metal Terminator Box set and one of the old Exo Armour concept model, sometimes referred to as a Mk1 terminator. The squad has the option of going to battle with a either two flamers or a single Flamer and an Assault Cannon. These Jes Goodwin Exos are a recent addition to the rouge Trader force. I tracked down a few sensibly priced Exo “bunny ear” Mk1 Terminator suits to make a full squad of 5. The one with a red bolter is the squad leader. The Heavy flamer is a Forge World tank Flamer kit with some bits added. I do have a Tartarus flamer I intend to swap it for in the future. Left to right. 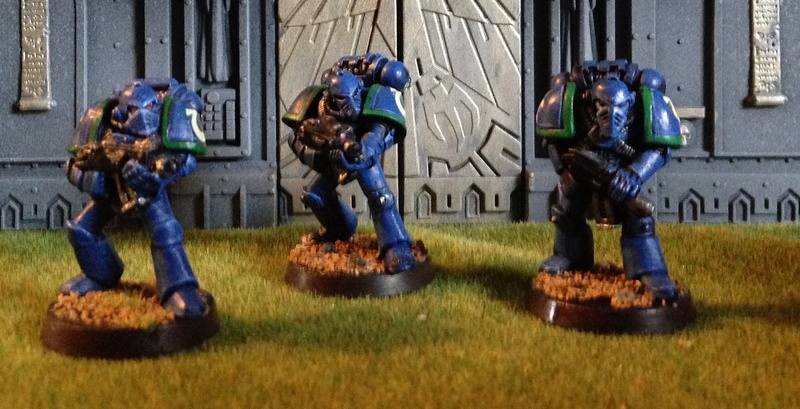 Brother Longun heavy bolter, unknown Space Marine, Brother Reeves, Brother Hamilton, Brother Repp melta gun. 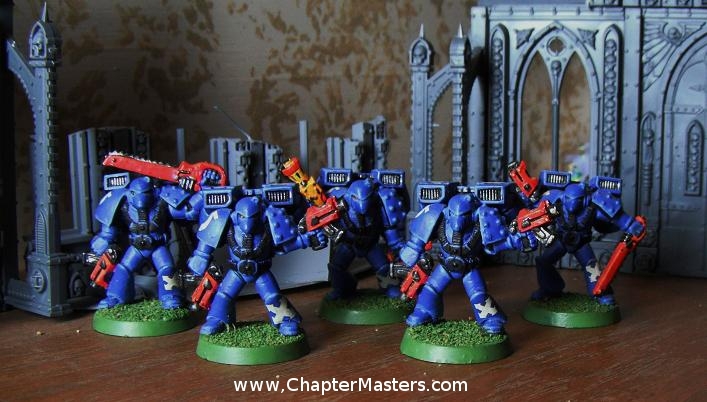 These plastic Mk6 Space marines come from the 1988 Rouge Trader box set RTB01. They were manufactured into the 90s along side the MK7 Strike Force Marines but were then replaced by a multi-part plastic Mk7 box set in 1995, which proved very unpopular so was replaced with the 1998 plastic Mk7 marines we use today. 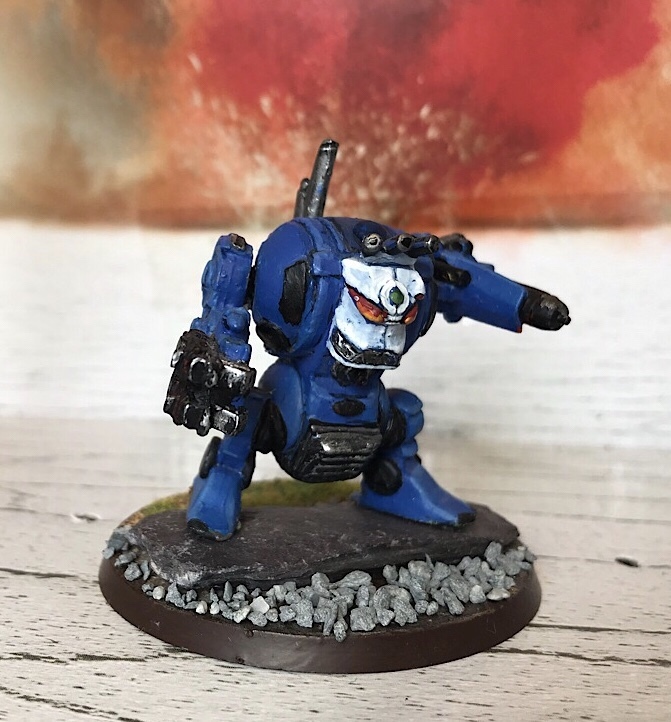 These Mk6 armoured Marines are still quite common and popular on auction sites. The Sergeant came with a choice of with a Bolt Pistol or Power Glove in addition to the Bolter. A part from a single flamer and Missile Luncher all other marines came with Bolters or Bolt pistols. 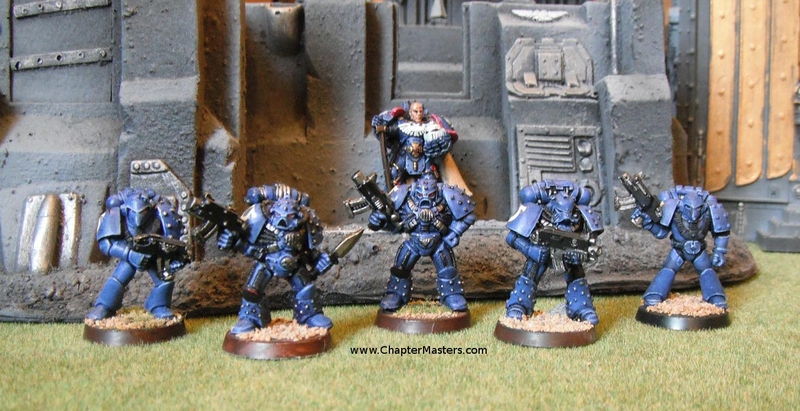 These are Transition Space Marines. Briefly manufactured in the early 90s, the MKVI models were only available in store. The Multi part Strike Force box set proved more popular and they were quickly dropped during second edition The Mk1, 2, 3, 4, and 5 variants did make it into the mail order catalogue as there were no alternatives for old Mks. The Mk6 marines were not used as the plastic armed Mk6 models were cheaper for Games Workshop to produce. A rather dusty MK1 Rhino. The exhausts have been re mounted due to two being missing. The handrails and original bolters are also missing. Two Storm bolters have been made from chopping down 4 old plastic bolters. The Dozer blade has also been left off. The Front hatch on this is more often seen on the MK1 Predator but did come with the Rhino Kit. This third company combat squad carry no less than 3 plasma pistols. Obviously they have no fear. These models were painted in the mid 90s. 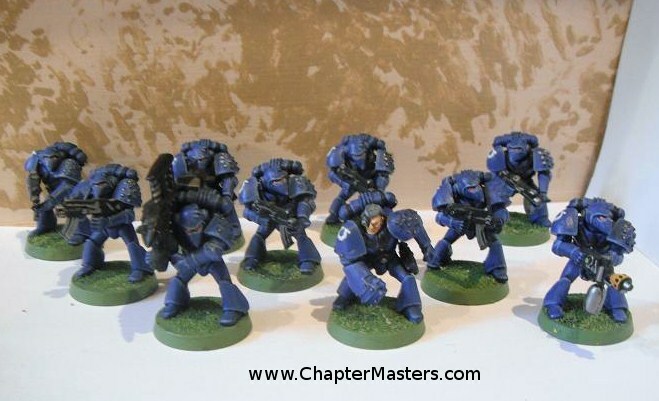 These are possible the rarest Assault Space Marines Citidel have produced. They were also some of the 1st 40k models I bought from the gamesworkshop. The plastic jump packs were obviously added much later. 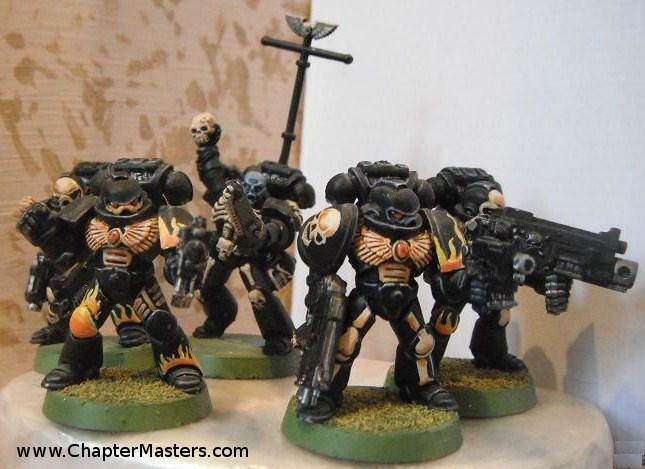 These models are very simular to the design for the Epic Assault Marines. Mk6 transition models like these are extremely rare. Games Workshop didn’t make them for very long. Possibly because they look like they have a bad case of Saturday Night Fever. Not even Jes Godwin knows why (I’ve asked him). You won’t even find these in any of the Space Marine Collectors guides as they are some of the only citidel minitures that could not be mail ordered. The only way to buy these was in random blister packs. The old Rouge Trader bikes had the Bolters mounted on the wheel hubcaps. The Sergeant used in this squad is actually meant to be a medic, shown only by the larger belt mounted gear. The Attack bike only came with a multimelta, which had an unconvincing stand. The Heavy bolter was a later option. The hardest thing with this model was making the rider fit in the seat! This squad has no shading being one of my earlier paint jobs. They also have no company markings allowing me to assign them to which every company I need including treating them as a reserve company. This website is just for fun and has no commercial objectives. Advertisements only covers the cost of our webserver and domain name. If you would like to donate to the this site, we will invest your donation directly back into running of this website.